iMessage support was added in iOS 5 (available through the preinstalled Messages app) and allows you to send and receive instant messages (IMs) to and from others using an Apple iOS device (and on your Mac, if you have Mountain Lion or later). Instant messaging differs from e-mail or posting to Facebook in an important way. Whereas you might e-mail somebody and wait days or weeks before that person responds, or you might post a comment to your Facebook timeline that could sit a while before anybody views it, instant messaging communication happens almost immediately. You send an IM, and it appears on somebody’s Mac, iPhone, iPod touch, or iPad right away, and assuming the person wants to participate in a live conversation, it begins immediately, allowing a back-and-forth dialogue in real time. The settings shown here display. If iMessage isn’t set to On, tap the On/Off button (shown in the figure) to turn it on. 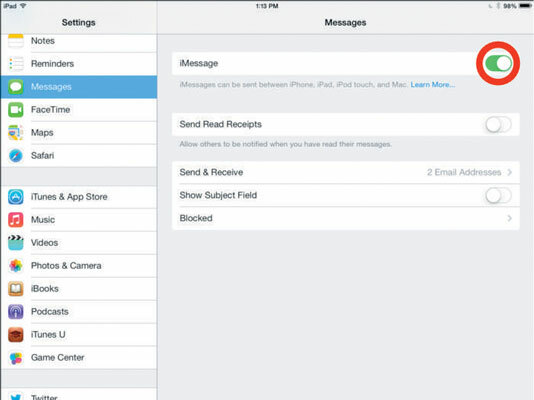 Check the Send & Receive setting to be sure the e-mail account associated with your iPad is correct. This should be set up automatically based on your Apple ID. To allow a notice to be sent when you’ve read somebody’s messages, tap the On/Off button for Send Read Receipts. You can also choose to show a subject field in your messages. If you want to include a subject field in messages, tap the On/Off button for the Show Subject Field option.